Looking for a new frozen pop recipe? 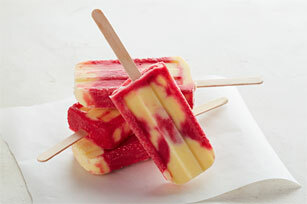 Try our Vanilla-Berry Pops recipe made with creamy vanilla pudding and raspberries. These frozen pops make perfect on-hand treats for everyone in the family. Beat pudding mix and milk in medium bowl with whisk 2 min. Stir in yogurt. Use pulsing action of food processor to process raspberries and honey until blended. Spoon pudding and raspberry mixtures alternately into 6 frozen pop molds. Insert handle into centre of each. Freeze 3 hours or until firm. Spoon pudding mixture into resealable plastic bag. Press excess air from bag; seal bag. Cut 1/4-inch piece off one bottom corner of bag. Use to pipe pudding mixture into pop molds. When ready to serve, hold bottom of each filled frozen pop mold under warm running water 15 sec. Press firmly onto bottom of mold to release pop.